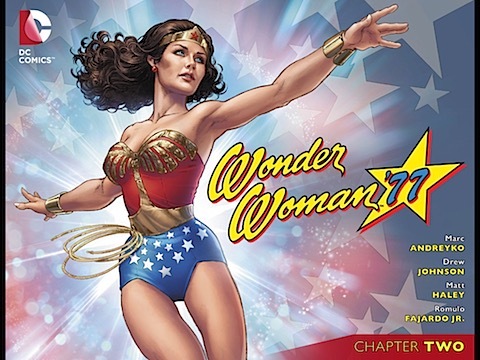 Lots to do today in the first Friday Weekly Wonder Woman, with not only this week’s new releases to deal with, but also playing catch up on the ones I missed reviewing over Christmas. All this despite there already having been a WWW this week already – it truly is a golden age, if not the actual Golden Age. 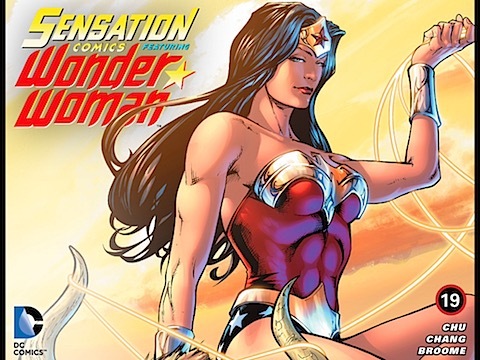 So after the jump, a look at Superman/Wonder Woman issues 14 and 15, which have some exciting revelations and returning arch enemies, another Injustice involving Diana punching Sinestro a lot, the second Wonder Woman ’77 continues the action down the disco and three whole issues of Sensation Comics look at everything from Wonder Woman’s inspiration of female soldiers through to people Instagramming her backside. And, oh yes, there was another Justice League movie released this week in the US. Guess who’s in that, too? Following the arrival of ‘Wonderstar’, Wonder Woman and Superman try to work out if he’s bad or good, despite the fact he seems more ‘boy scoutish’ than even Superman. 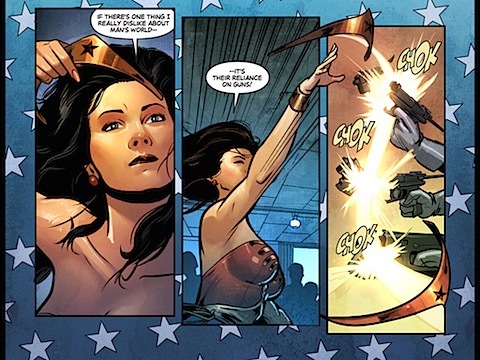 Fortunately, while Superman’s more than a little bit vulnerable to magic, Wonder Woman is made of sterner stuff and saves the day. 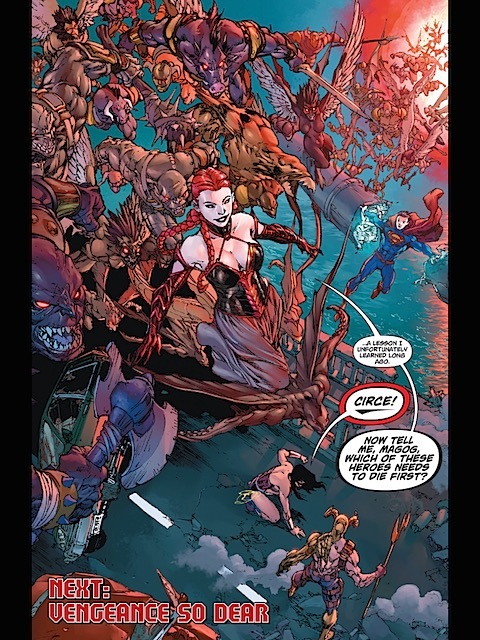 Unfortunately, Circe has other ideas – and an army. 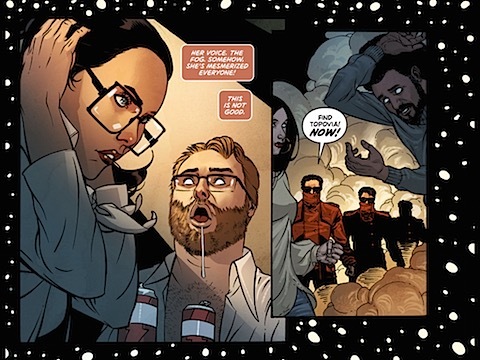 They’re a definite step up from the first issue of Peter J Tomasi’s run, correcting a number of that issue’s flaws, but they’re not without their own problems. 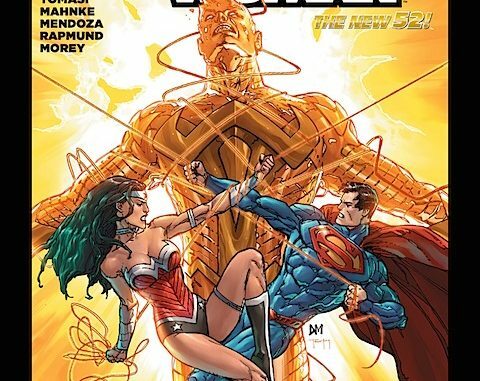 So the first correction is that we now have some worthwhile adversaries for Wonder Woman and Superman. Magog, for those who don’t know, was actually a future enemy of a retired Superman in the Alex Ross series Kingdom Come. There, he’s the leader of a new wave of superheroes who have decided that it’s time to start killing the supervillains, rather than sending them to prison. He was also a regular Superman villain in the sense that his powers had a scientific source. Here in the nu52, he’s different. 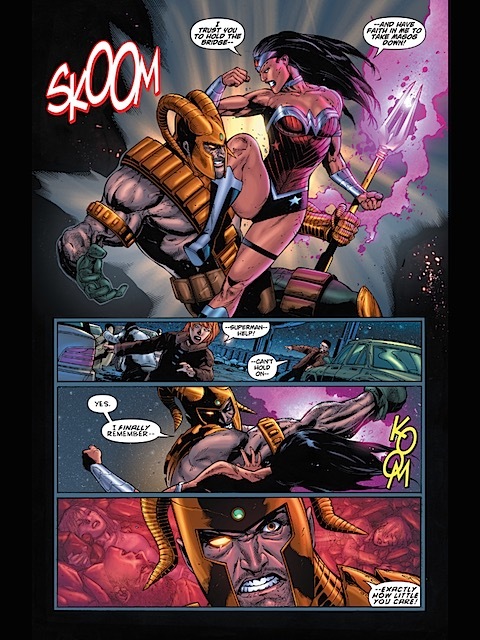 In keeping with his name, his power is magical; he’s also just a normal boy, orphaned by the first Apokolips invasion that was flashed back to in issue #13, then transformed into Magog by Circe – the lack of care for the ‘little people’ evidenced by Diana in issue #13 is coming back to bite her. 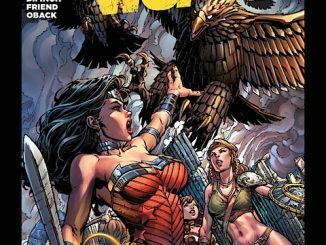 So all well and good, particularly on the Circe side, since it’s good to have some decent adversaries for Wonder Woman, particularly in titles that aren’t specific to her and would be read by a wider audience. 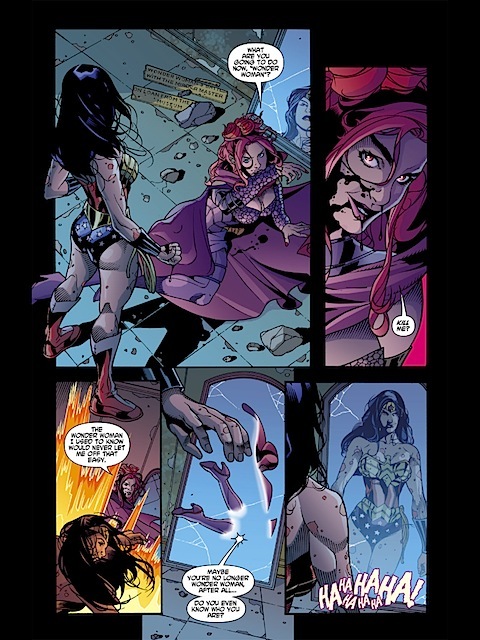 Circe’s musings on men and women also indicate that Tomasi is likely to use her as a commentary on disrespectful gender relationships, with Diana and Clark illustrating the counterargument, which again is a lot more ambitious than the ‘nagging girlfriend’ we got in issue #13. 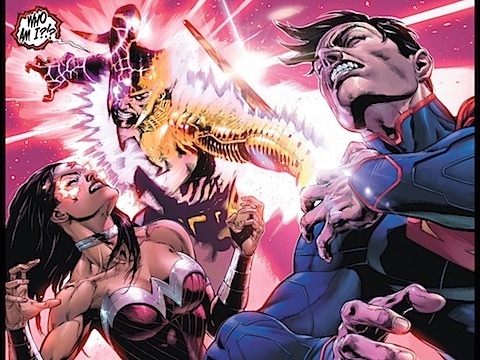 Slightly problematically, though, we have the fact that both Superman and Wonder Woman keep getting a clobbering at the hands of whomever they’re facing, and the fact that Wonder Woman is the goddess of war but no one actually seems to know what that means. 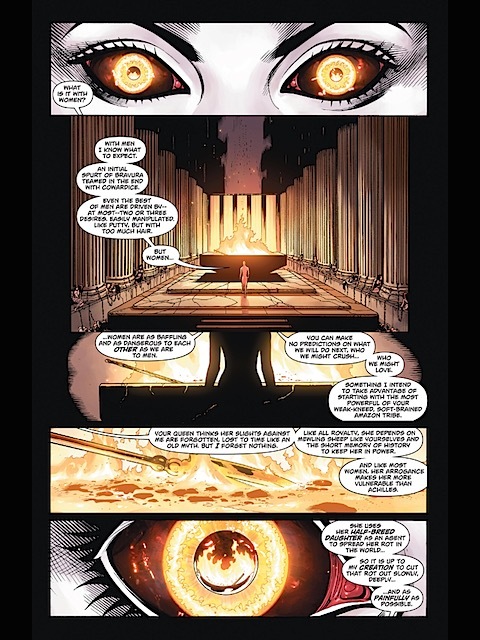 Brian Azzarello, who came up with the idea in the first place, gave her the ability to summon armies and create weapons from thin air, while Charles Soule gave her the ability to telepathically order soldiers about. 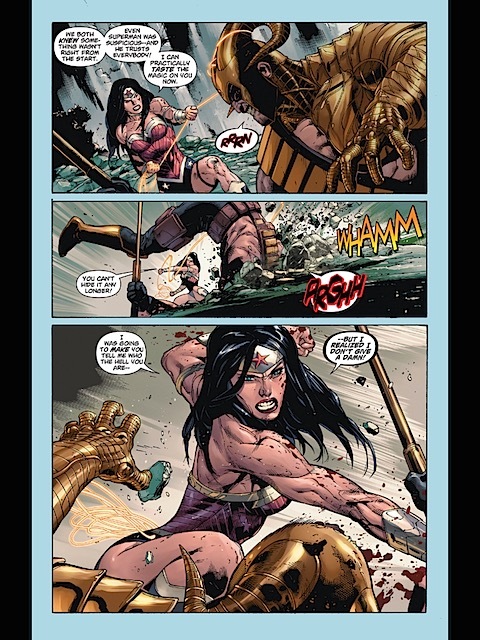 Here, it appears to mean ‘hitting people’ – and not even especially well, since Magog seems able to withstand Wonder Woman’s assault quite easily. 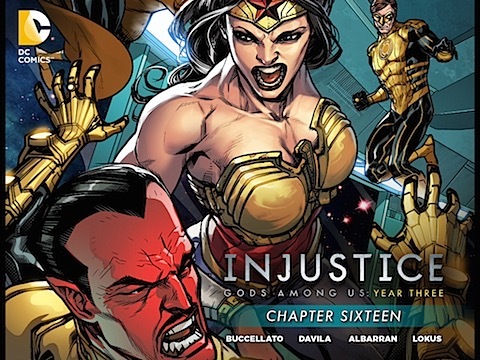 If you’re going to make her a goddess, DC, make her worthy of the title. 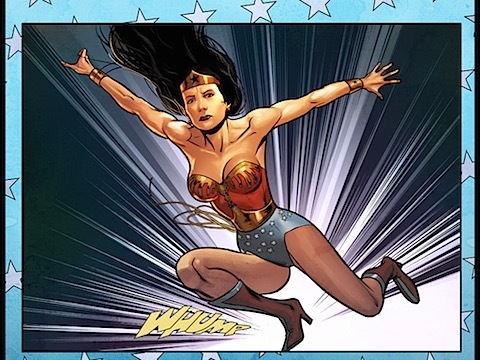 Still, at least she’s got someone almost goddess-like to face now (although I’ll probably have to talk more on that next week when the next issue of Wonder Woman comes out). 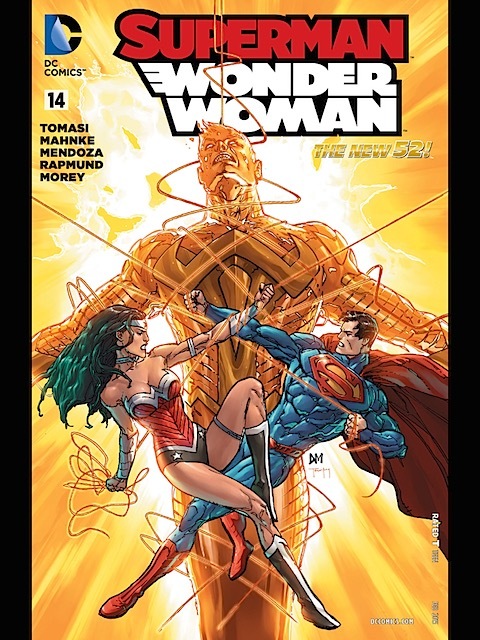 Otherwise, a quite fun pair of issues for shippers who like Superman-Wonder Woman, since it provides some nice relationship moments for the two of them. 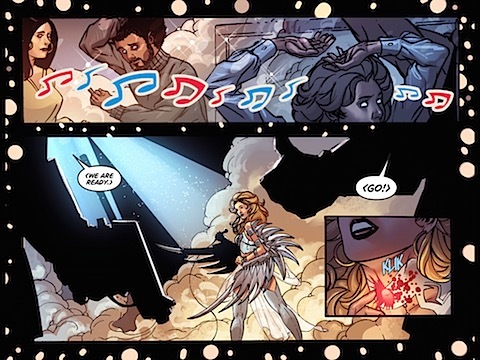 Tomasi perhaps tries a little too hard here, almost trying to justify the relationship rather than letting it just exist and breath, with Wonderstar commenting on how obviously in love the two are and issue #15 having a running theme of ‘trust and faith’. 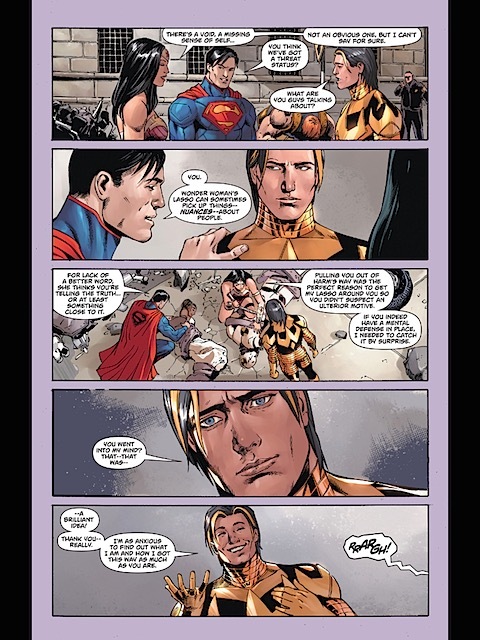 But it shows that Tomasi’s heart is in a better place that it was seemingly in #13, veering more towards the more respectful relationship depicted by Soule in his run. 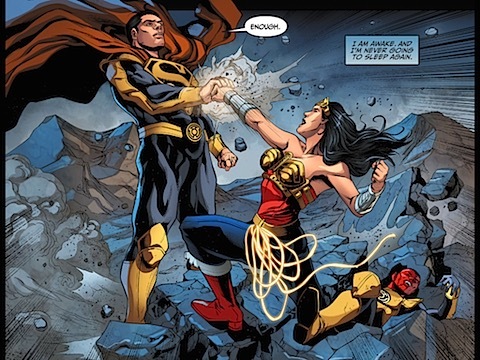 With Ares preventing anyone else from interfering, Diana gives Sinestro a right clobbering. 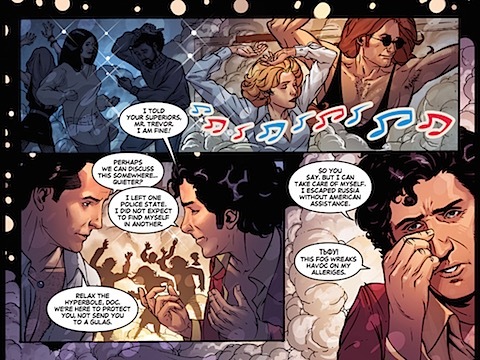 He’s only saved by Superman waking up (with Ares’ help) and intervening. Diana demands Clark give up his new yellow ring, something to which he reluctantly agrees. But then the Spectre arrives to take the group to fight Team Batman. The odds don’t look good. Despite the fact that it’s all about the clobbering, it’s not bad. 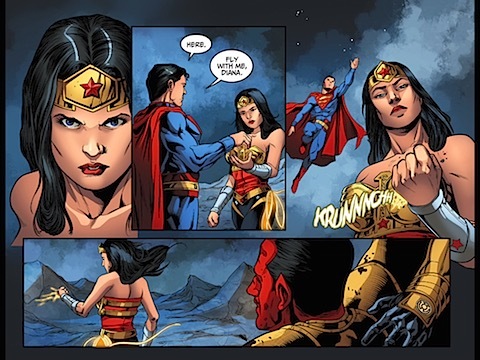 Diana obviously gets to demonstrate who’s the boss to anyone who would mess around with Superman. She brings Clark back from the dark path he’s been treading. 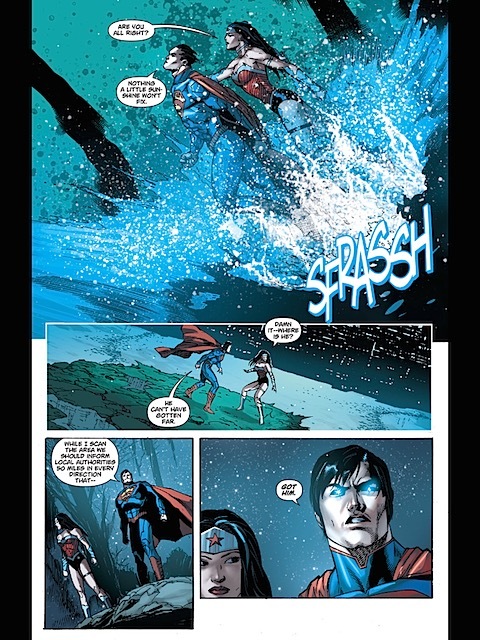 True, Clark’s first conversation with her are about Lois, which is a bit insensitive with the benefit of insight into Diana’s dreamworld last issue, but on the whole, not bad for Injustice, with a decent cliffhanger to boot. 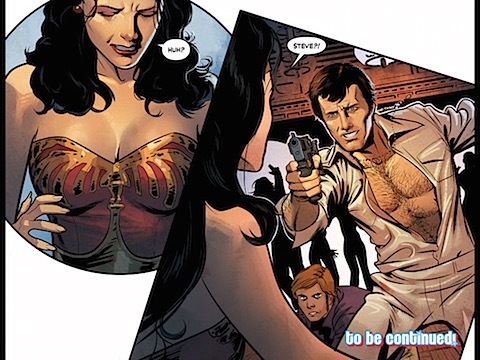 Steve Trevor tries to persuade the defecting Russian scientist to come with him. Sounds like a job for Wonder Woman. As with the first issue, there’s very little plot, with most of the story being various fights. However, the artwork is a little better, with Steve Trevor looking a lot more like Lyle Waggoner than he did before, and it does feel a little more like the TV series, too. 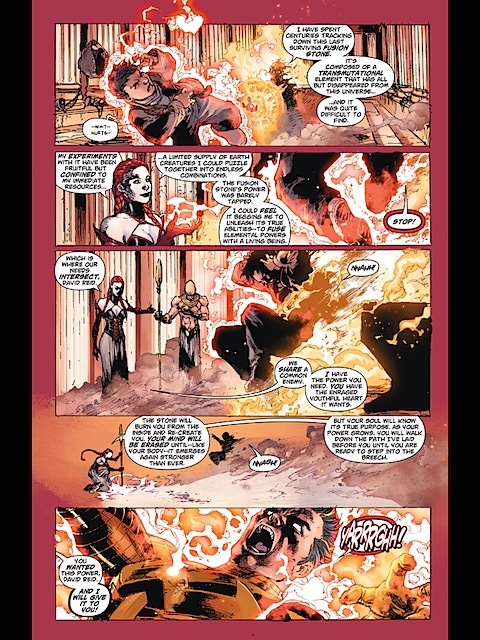 On the other, the TV series often depicted evil women, such as Baroness von Gunther, as being deluded and used by patriarchy, ultimately being convinced to do the right thing by Wonder Woman’s more enlightened thinking. So problematic or not? Let’s wait until the next issue to find out. On the whole, though, an enjoyable enough title, albeit one with very little to say for itself, rather than merely cover version the TV series. 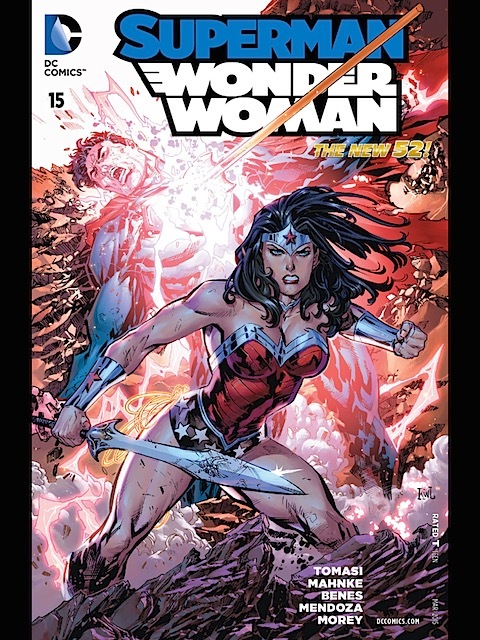 I’ll cover this one only briefly, since it’s a standalone story that doesn’t technically feature Wonder Woman. 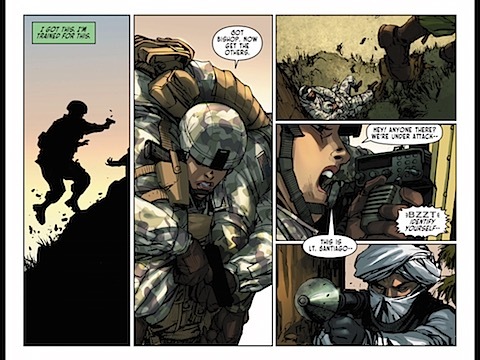 Instead, it’s more a motivational piece, with a female soldier having to show she’s the equal of the male soldiers, ultimately drawing on the strength of every woman to do so, but inspired by Wonder Woman comics. 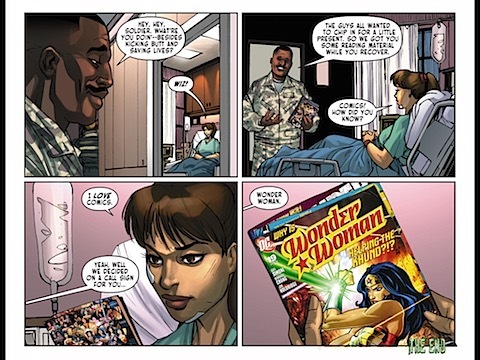 It’s a somewhat obvious piece, touching on exactly the irreproachable things about girls, education, the Taliban, etc, you’d expect, as a demonstration of the power of women and women role models, but it’s not really Wonder Woman or much of a story. 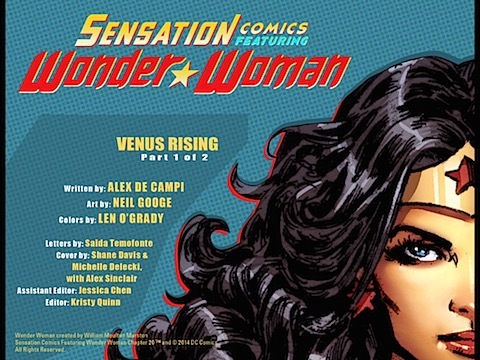 A two-parter set in outer space, with Wonder Woman helping a bunch of explorers venture to Venus, where they encounter some aliens. 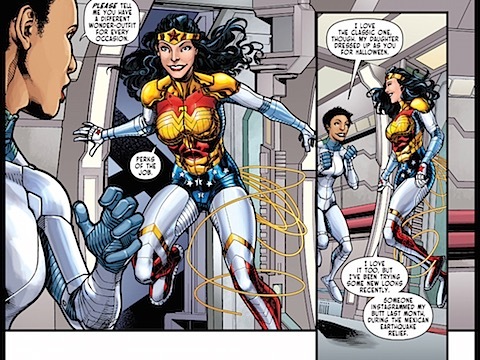 It’s a bit less serious than that sounds, though, and we get the first appearance of the ‘Wonder hijab’ as well as the ‘Wonder spacesuit’. It’s also a little odder than it sounds, too. 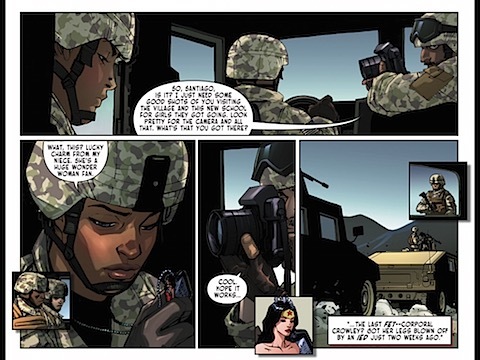 The first issue takes valuable pages to give us a scene in which Wonder Woman discusses people Instagramming pictures of her backside and cellulite (does Diana get cellulite, one might wonder, having the beauty of Aphrodite? ), as well as ‘an entire kink subculture of people who want to be punched or slapped by me’. 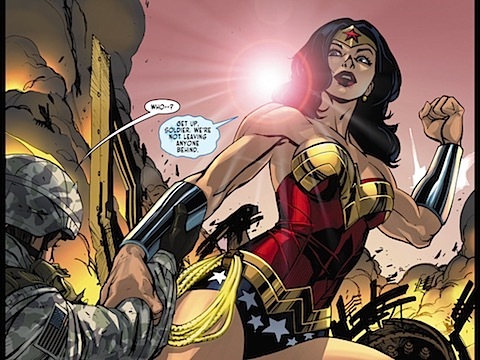 When the aliens come there’s a lot of fighting, but there’s a twist that I won’t give away that’s quite Wonder Womanish. All the same, despite some laugh out loud moments, it’s something of a throwaway storyline, purely for entertainment purposes and with that general oddness, so perhaps not something to rush to read. A follow-up to last year’s Justice League: War, Throne of Atlantis is similarly an adaptation of a previous comics storyline. Here, though, the writers and animators have to innovate a lot more, as there were far fewer issues to adapt and this has to serve as an origins story for Aquaman as well. It also has to skip the issues of storyline between War and Throne of Atlantis that moved the other characters on. The story revolves around the battle for the throne of Atlantis, as one faction tries to launch a war agains the surface world, which the Justice League has to step in and prevent, the other faction needing a leader, something the newly orphaned Aquaman who doesn’t really know who he is, isn’t ready to do. Largely, this is an Aquaman film, with some guest appearances by the Justice League. Mera – Aquaman’s future wife – is probably the most interestingly handled of the supporting cast; by contrast, Aquaman arch enemy Black Manta (voiced by The Blacklist’s Harry Lennix) doesn’t even get to take his helmet off – beyond his name, you’d be hard pressed to know who he is or his motivation. 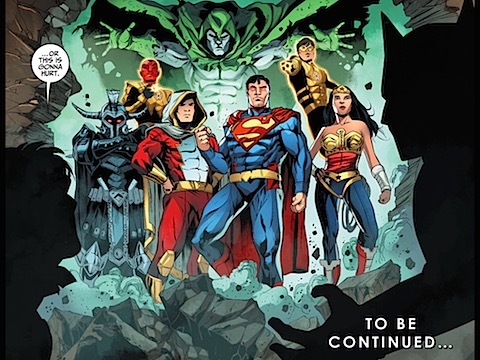 However, there is an ongoing storyline about the Justice League itself, which at this point is less a team, more a name (something that still hasn’t been decided on). 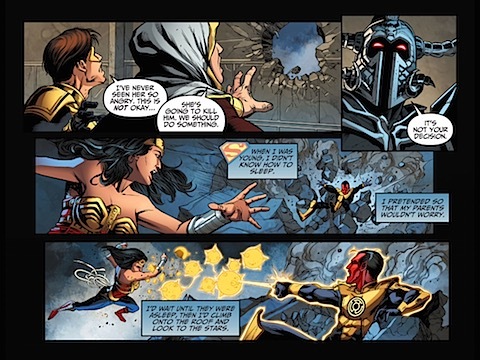 Cyborg’s continuing struggles with how human he is are also a strong theme, and Superman and Wonder Woman’s romance hits the fast track, going in a single scene from first kiss above the Parthenon (a change from the original) through to establishment of Diana’s secret bespectacled Diana Prince identity and first date at a Greek restaurant. 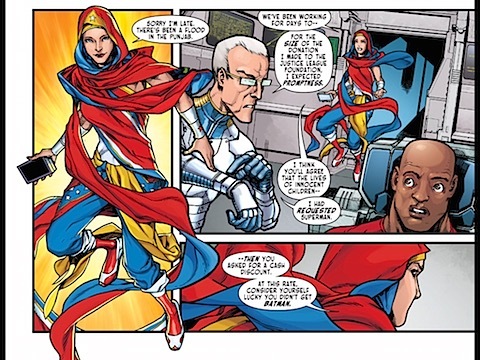 The latter also has the arrival-proper of Lois Lane, who gatecrashes the date, trying to stake a claim on Clark. 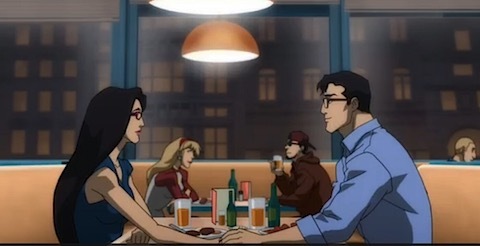 It’s a little unedifying, particularly when Clark is reluctant to admit that he’s on a date, but once it’s clear Diana understands this whole secret identity thing and boundaries have been established, everything settles down. The League themselves get short-shrift when it comes to fighting main baddie Orm (voiced by Being Human (US)’s Sam Witwer) – bar Batman, of course, who must not be shown up. 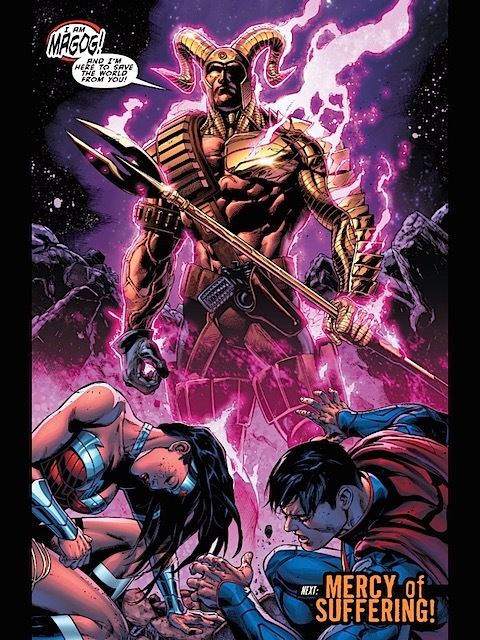 Ever – with everyone from Superman through to Green Lantern getting spanked by Orm and his mighty trident. 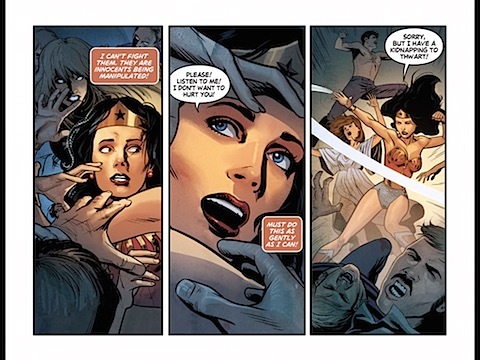 Wonder Woman barely even gets her Lasso out and makes little contribution to the story beyond relating the stories she’d read as a child about Atlantis. It’s all in the interest of making Aquaman look good, but a little saddening for fans of the other characters. There are good moments packed throughout the movie, including a scene showing Batman and Superman investigating together that’s amusing and as close to sending up Batman as DC will officially allow, I suspect. The fight scenes are surprisingly adult and brutal, at times, and there’s even some bad language. 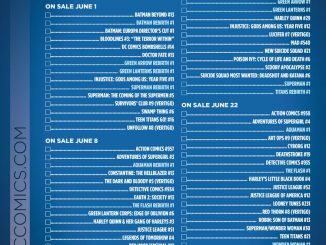 The ending, involving Lex Luthor, also appears to be setting up another sequel, whatever that might be (please not Forever Evil. Please?). It’s worth noting that there’s also been some minor recasting since Justice League: War, with Nathan Fillion returning to the role of Green Lantern and Jerry O’Connell taking over as Superman. Rosario Dawson is a step up from Michelle Monaghan’s Renaissance Fair version of Wonder Woman, but still plays her very flat and, ironically, lacking in animation. On balance, nowhere near as good as the first movie, but a decent effort nonetheless that’s probably better for Aquaman fans than Justice League fans.